And now abide faith, hope, love, these three, but the greatest of these is love. Love, such a powerful word, action and desire. It alone can transcend all wrongs this world could ever know. Universally we all long for love, every human who has breath, needs love to survive. If you have ever traveled to a third world country and spent time in orphanages, you would see the prevalent need children have for love. Since they lack so much of it, they can’t be hugged or held enough!Love,in and of itself, can change even the bleakest of hours. Mentioned three hundred and ten times in the Bible, it is the most powerful message Christ not only displayed at the cross, but commanded us to imitate when He called us to follow Him. Never did Christ force Himself upon us. Instead, He patiently stands at the door of our hearts knocking, waiting, yearning for us to respond. To allow Him to come in and transform our once hopeless, empty hearts and lives. Hopeless because of a world shattered by sin, hate and hurt. A world deceived by the deceiver himself, stripped of peace and purity. Hundreds of years ago voices rang in unison saying, “We don’t need a Savior, we don’t need Him, we don’t want Him, we make our own choices, we have a better way.” Even today, we mimic those same voices, desiring to silence the voice of Christ. The result is a world gripped with hopelessness. As believers, we hold fast to the faith of our Lord Jesus. We should see in the midst of hurt and pain that we are never without hope. We can stand firm on the truths of Christ and when given an opportunity to display Him to the world, we should do so. No greater joy or purpose have I found in my own life then when traveling and sharing the hope I have within with others. In doing that, I find the greatest fire, purpose and joy. When sharing tears with the hurting and reminding them their life is not a mistake; and in the midst of a trying time their life is not over. A couple of weeks ago the US came to the gripping reality that we are not immune to terrorist attacks on our homeland. I watched in horror the tragic events at the Boston Marathon unfolding on my television. My heart immediately broke for the victims and their families. As a believer, all I could think is we have to do something. We have to reach out somehow. I’m on the Board of Friends of Bethany, a non-profit foundation founded by Bethany Hamilton, to reach out to victims of shark attacks, as well as other traumatic amputees. As we became increasingly aware of how many victims lost limbs, we knew we needed to offer Hope in some way. As I shared in my last blog, God made us very aware we were to go there. As our team, which included Tom Hamilton, Bethany’s dad, Mike Coots, another board member who lost a leg in shark attack, and me, headed to Boston, it was a step of faith for us to go. Since security was very high, no one was being granted access to the victims. We weren’t sure how the doors would open, but we knew we needed to walk forward in complete faith and trust that God would open them. Upon arrival, we went to every hospital where victims were. We talked to the liaisons of the hospitals sharing about who we were and why we were there. We walked away from those meetings pretty discouraged. Everyone we met at the hospitals were very kind, but they weren’t allowing anyone in; we grew weary, second guessing if we would get in to see anyone. The voices of defeat were on the forefront of our hearts, trying to evoke fear and discouragement. Our hotel faced the same street, on which the bombs exploded, literally steps away for the actual sight. There was such a somber feel all around the area. That coupled with all the media, there was no way to escape the constant reminders of what had happened days earlier. People lacked hope and now, we as believers who came to offer hope, were forgetting to hold fast to that hope. You see we were forgetting that God is the one who opens doors. He is faithful at all times, even in a world who wants to silence Him. That evening at the hotel I sat in my room praying for the victims and their families. I was praying for God to continue to lead our footsteps as He had lead us all the way to Boston. Then the most amazing thing happened. At 9pm my phone began ringing with calls from doctors and hospital administrators sharing how they were excited we were there and were working on getting us in to see the victims. Then I had family members of victims calling, inviting us to come visit their family members who had lost limbs in the bombing. I was on the phone until midnight with people, yes midnight! God, in those hours put together a schedule to go in and bring His hope to these families. I couldn’t sleep all night. I was blown away yet again by His faithfulness. The next morning, we found ourselves getting through security and in the ICU waiting room, waiting to see a mother and daughter who were sharing a room together. Both were majorly effected by the bombs. As they were finishing their therapy, the trauma team came in to talk to us. When they heard about who we were and why we came, I saw God begin to use us to minister to the medical team as well. I guess we forget about the heaviness they too are facing seeing all of these people who had lost so much. We were able to give them t-shirts and Soul Surfer DVD’s. They were so full of joy and excitement. They began saying, “Oh you have to see this person, and you have to meet that person.” They started going to other family members on that floor telling them about us. It was unbelievable! People began coming in to see us and talking with us and we were able to give them gifts and Aloha (love) from Hawaii. After hearing our story, they began to realize there is Hope and that they will get through this. There was a dad who came into the ICU unit and he looked so broken. His daughter had lost her leg and they were fighting to save her other leg. His son-in-law had lost his leg too. In the craziness that transpired after the bombing, they were sent to separate hospitals and hadn’t been together since. As he shared his heart, he began asking us questions and you could see his spirit being renewed. He got silent for a moment and then looked to Tom, his eyes filled with tears and he said, “You know exactly how I am feeling right now.” Tom’s eyes filled with tears as well and he said, “Yes, I do.” At that moment I could remember all the pain I saw in Tom’s eyes while Bethany laid in the hospital. Now God was bring purpose through that pain he had felt years ago. After all he had faced, God had painstakingly prepared him for this very moment. Tom was able to offer the hope he had in Christ to this hurting father. Father to father, tear to tear. When we entered the room of the mother and daughter, we couldn’t help but hurt for them. The mother had lost both legs in the bombing and the daughter had almost bled to death after shrapnel came close to severing her main artery. The doctors were fighting to save her leg as well. They were familiar with Bethany’s movie and the daughter had really looked up to Bethany’s story. Mike, having lost a limb himself, was able to encourage the mother and shared with her how she can live a full life. This would not keep her down. The mother saw some shell bracelets I was wearing and she lit up. She said, “That’s something I can do. I love shells and have collected them for years. I could make jewelry out of them.” It reminded me of when Bethany had lost her arm and she was wondering what she would do with her life. I remember her telling me one morning in the hospital, “Sarah, maybe I’ll be a pro soccer player, or photographer.” “Maybe,” I replied, “but Bethany, God gave you a gift in your surfing, and just because you lost your arm, doesn’t mean He took that gift away.” You see in the greatest moments of despair, we are never without hope. I took those bracelets off my hand and gave one to that mother and daughter. I told the mother after she makes some of her own jewelry, she could send me something. I wanted her to remember that there was something she could and would do in her future. 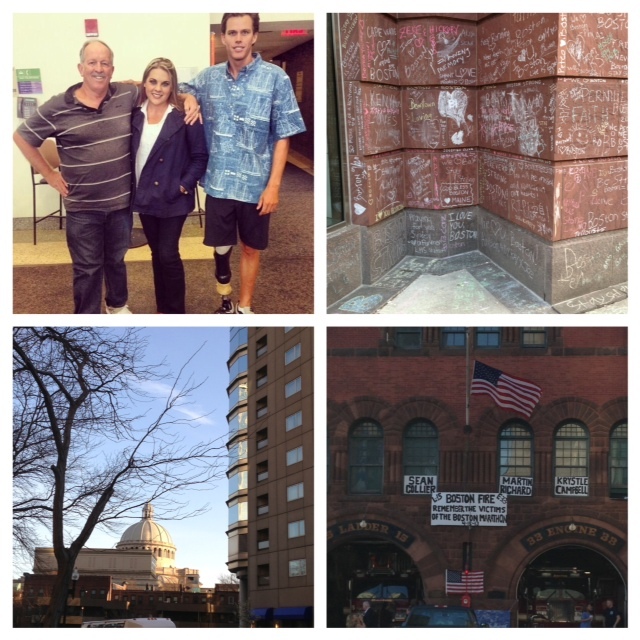 We saw that in every footstep we took while in Boston that they were directed by the Lord. The next day, Tom flew home. Mike and I had one more day and we were sure God would open more doors. The night before, I received an email from a young girl who had seen the movie and recognized me. She found my email address and wrote me. She was born without a hand and had looked up to Bethany and me. She asked if there was any way we could meet up. We made plans to meet that next day. Her mom and her met me at Starbucks, and she was so sweet. She had been dealing with a bad infection and the doctors weren’t sure what it was (that’s why she was at the hospital). Her mom shared how she had been very down and discouraged by it. Her mom began crying and said, “I felt like her meeting you was a sign from God that she needed encouragement.” We shared for an hour and I walked away feeling like I was the encouraged one. I thought, “God, if this was what You had for me today, I’m so blessed, but if You have more, please lead us to what You have. I then received a call from a girl whose sister lost her leg. The sister was extremely depressed and refused to see anyone. Finally she encouraged her to allow us to come to see her. We took a taxi to go see her. Once we cleared security, the guy who was representing the young lady stopped us and said, “No photos,” which we totally understood. We didn’t want to commercialize what they had gone through. When we went in, this sweet lady looked like the weight of the world was on her shoulders. We began sharing with her and after a few moments she saw Mike’s prosthetic and invited us to sit. She began asking him all kinds of questions. You see Mike had lost the same leg in the same place as she had. It was so amazing to see how she opened up. We were able to talk to her for an hour. By the end of the conversation, she was saying she wanted to run the marathon next year. She went from not knowing if she would or could do anything, to seeing and dreaming big. I told her if she runs it, I would run it with her. We invited her to come to Kauai and spend time there to heal. She told us we didn’t have to invite her twice and she would come. As we walked away from that room Mike said, “Sarah, can I hug you.” As we hugged, he said, “I will never be the same, I am forever changed.” Mike was experiencing the hope and purpose he had in being able to share with others through what he had faced. The great question seems to be, if there is a God then why… ? I don’t have the answer to all the whys! I’ve never had all the why’s answered in my own life. The truth is, when we come through tragedy, heartache and pain, we forever see things differently. For me, I choose to live with a Hope and a purpose. To surrender all to Jesus and see Him use my story as His story to the World. I am humbled and blessed to do so! I have never walked away from the opportunities He has given me, radically changed. He is faithful and sovereign. Just because there is bad in the world, doesn’t mean He is an unloving God. No, quite the opposite. He loves us so much, that he is always available to you and I. There is no certain way to have access to Him, except through Jesus Christ. The beauty of God is, we come to Him just as we are and He is there! His arms are open wide to you and me. I love that!! Just as I am, flaws and all. He makes all things beautiful. I want to close with this last story. We had shirts made and after going around and passing them out, we had a few left over. On our last day there, they had opened up the street where the bombs had gone off to the public. 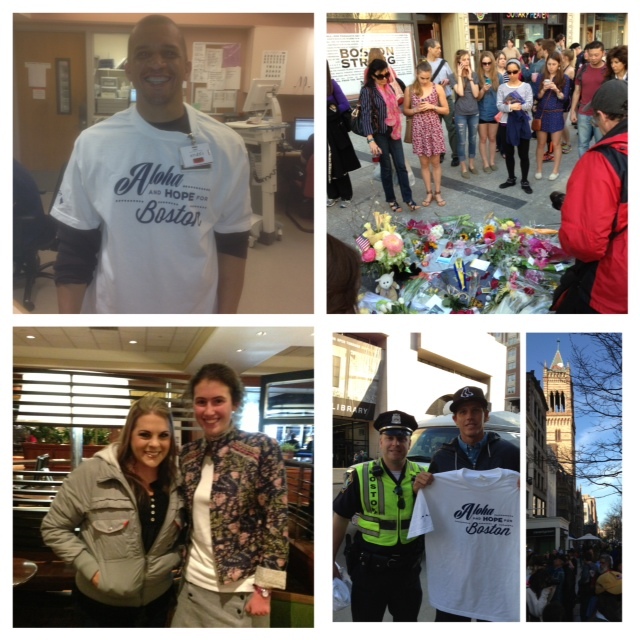 Mike asked if we should go give the shirts to the police and first responders on the streets. I thought is was a great idea, so we walked down the street giving out shirts and talking with police officers, firemen and swat team members. They were so blessed and honored that we would give them shirts. It was an exchange of thank you’s back and forth. Us thanking them for all they had done and them thanking us for coming to Boston. It was amazing to see so much love and it made me realize this is what the church should be doing. Going out, sharing the love of Christ. Making His voice shout loudly to the World that He is there, He is not dead. He is alive and wants to make us alive in Him. We had a girl come up to Mike crying, and said, “You’re walking already!” We smiled and had to gently let her down, sharing that Mike did not lose his leg in the bombing. As she learned why we were there, she cried all the more. You see the world can’t grasp that God is so loving and He would prompt the hearts of a few to go the distance and be His hands and feet on the ground. May we all be willing to be out there, and in doing so, we will experience life in its fullness. Thank you to all who prayed and supported us. You made this trip possible. We can’t all go, but we can all have a part. No one part is of more value than the other. Every part is so important to make it all work out. Therefore, my beloved brethren, be stedfast, unmovable, always abounding in the work of the Lord, knowing that your labor is not in vain unto the Lord.